Moe Howard and WC Fields during their morning show on COOL 104 FM on April 19, 2001. Prior to closing its doors, the Columbia School of Broadcasting surrendered a diploma to future KMYC DJ Moe Howard. 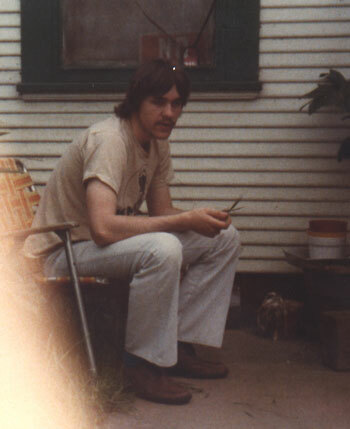 Seen above, in 1978, attired in a radio station T-shirt. They had old style microphones on them. Since there was no budget for frills, KMYC employees designed and purchased the shirts on their own.....as a result, obviously, some could no longer afford HAIRCUTS! In the summer of 1979...KJAY in Sacramento was a dusk to dawn, religious format radio station, broadcasting from inside a medium sized trailer. When Moe Howard was there on the weekends it was the announcer's job to cue up syndicated programs. Sunday morning KJAY allowed listeners to pray on the air while somber organ music played in the background...Perhaps someday someone will reintroduce this format. Moe moved on to KOBO in the Summer of 1979. KOBO was a Yuba City station and was very successfully playing Top 40 tunes...500 watts of pure power. 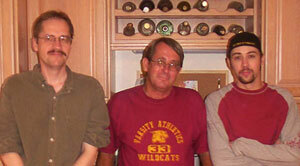 Later in 1979 Moe began working for Harlan Communications in Yuba City. These were two stations; KUBA and Z104. About the last 37 years that he has worked there he says, "I've done some things of which I am not exactly proud." KUBA allowed Moe to play country tunes for the masses. This very popular local station at the time featured such DJ's as Jim Swanson, Levi Chase, Mike Fagan and Ross Payne. 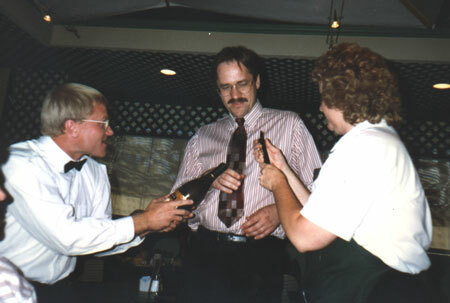 In 1985 Moe and Randy Joe Blount teamed up on KUBA during the mornings. Z104 changed into COOL 104 and became a live station, and a local powerhouse, in September 1989. 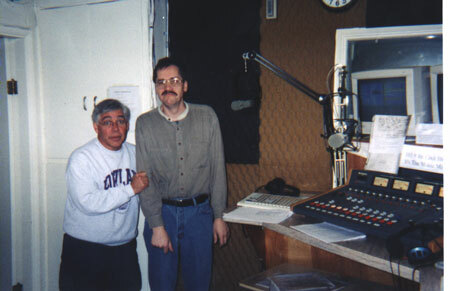 Moe was the first DJ to be heard on COOL 104 and played the first song on that station - and that song was "Allentown" by Billy Joel! As of September 5, 2016, Moe now works for STAR 94 FM in Grass Valley. Scroll on down the page and see more memories of his illustrious career. WC Fields is one of the funniest and most liked personalities in town. 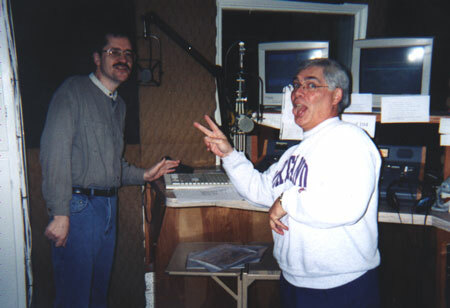 Moe and WC were the morning team on COOL 104 from 1996 to 2001 and for one year from 2001 to 2002 on AM 1600 KUBA. WC: SO YOU ACTUALLY WENT TO CHURCH YESTERDAY? MOE: YOU WON'T BELIEVE WHAT I SAW...A WOMAN WAS SMOKING. MOE: I WAS SO SHOCKED, I ALMOST SPILLED MY BEER. WC: YOU KNOW YOUR WIFE IS BEING UNFAITHFUL WHEN YOU NOTICE YOUR DOG TAKING YOUR PIPE AND SLIPPERS TO A HOUSE DOWN THE STREET. WC: SO DID YOU HAVE A GOOD MOTHER'S DAY? MOE: YA...ALL OF US KIDS GOT TOGETHER AND COOKED AN ENTIRE MEAL FOR MOM. MOE:...THEN THE WARDEN MADE US LEAVE. WC: SURE IS A NICE NEW SUIT CHRIS GILBERT (the news guy) IS WEARING. MOE: HE WASN'T EXPECTING IT EITHER....HE DROPPED IN ON HIS GIRLFRIEND, AND IT WAS DRAPED ACROSS THE COUCH... SHE SAID IF IT FIT HIM, HE COULD HAVE IT. Moe and W.C.'s Classic (and schizophrenic!) Trivia Champ T-Shirt. Moe's done some things of which he is not exactly proud. From 1994, COOL 104 DJ's Briggs Moor, Moe Howard and R.J. Blount (aka Conner) at the grand opening of the Tres Amigos restaurant. You'll note that some reps from Miller Genuine Draft were there that day too! 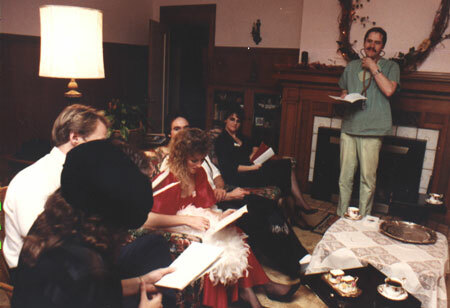 COOL 104 held a few murder mystery parties. At the time, this was the Wix in Yuba City. Later the Moore Mansion Inn. 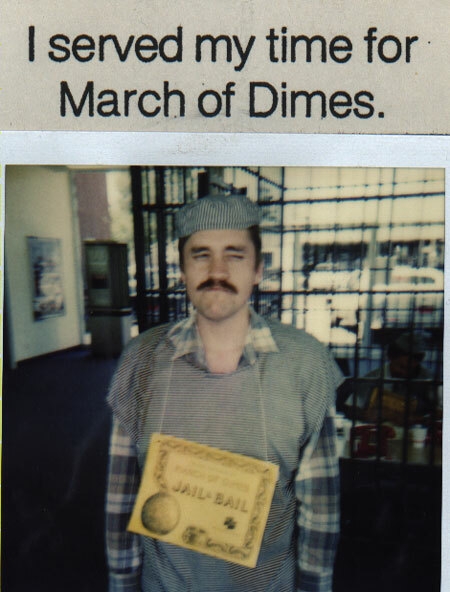 This is circa 1989. 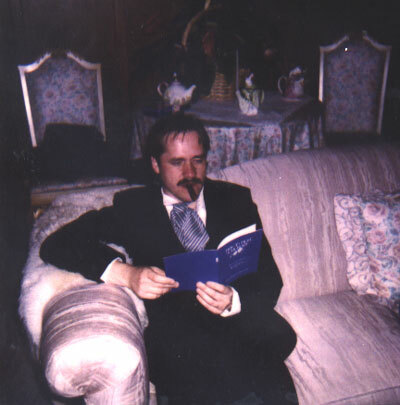 Time Travel...another murder mystery party. Granny's Kitchen hired a couple of "hot shot" waiters...the job lasted one night...with Briggs Moor. 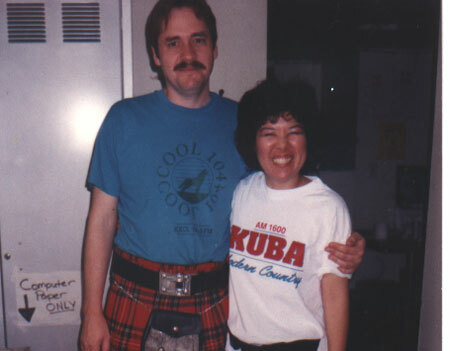 COOl 104 sponsored the Yuba Sutter Scottish Festival during the 90's at the Yuba Sutter Fairgrounds...with Cindy from Marketing. Yes, that IS a kilt! 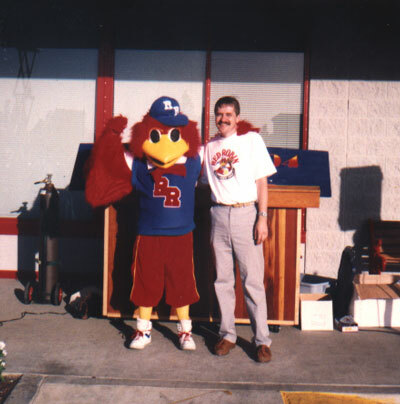 Moe seems to work better as a team....the grand opening of Red Robin in 1992. 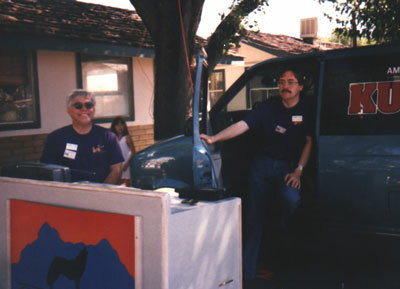 Moe and WC, from 1997, at the California Prune Festival. From 2000, meet Arletta Van Hausen. 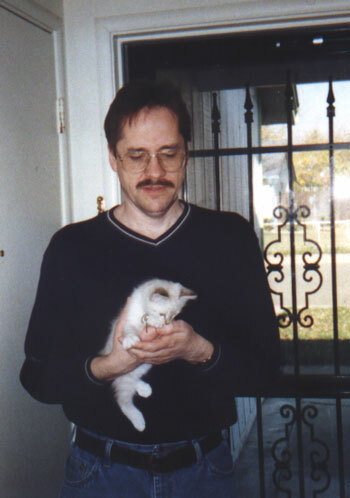 She's the little white kitty....now 20 pounds. Three radio "icons", Moe Howard, Larry Matthews (retired KUBA and COOL 104 DJ) and Derek Moore (of Sacramento's THE EAGLE) got together for a wild party on July 28, 2001. There weren't any Corona bottles left standing! Final word: I have been listening to Moe Howard since about 1985. I have always been impressed with his humor, class, creativity, kindness and professionalism. That is why I asked Moe to provide me with his history and some photos. I just wanted to dedicate a web site to a person who I consider to be one of the best Radio Personalities I have ever heard. 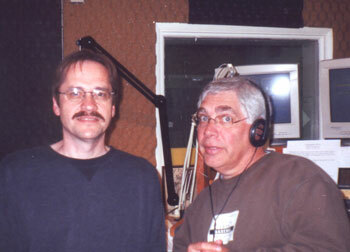 After 37 years at KUBA he will be missed by thousands of listeners! But I know he will have continued great success in his new radio venture! This web page was established on April 20, 2006. This web page was last updated on September 5, 2016.